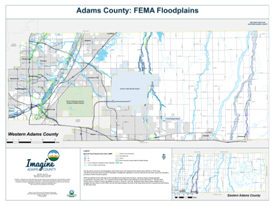 Three types of flooding that can occur in Adams County are: flash flooding, river flooding and dam failure flooding. The South Platte River Basin, which runs through western Adams County, periodically floods when snow runoff in the tributary streams combines with intense rainstorms. These types of intense rainstorms occur between May and August and are a major cause of flooding in the county. The most frequent flooding events are quite localized in nature, resulting from heavy rains over urbanized areas that are not able to appropriately handle storm water runoff. Adams County has 36 dams located within the county. While dam failures are unlikely, it should be noted that the conditions of private dams are unknown and not subject to building standards which may lead to poor structural conditions and contribute to a dam failure. Dam failure floods are primarily a result of hydrologic or structural deficiencies and can also occur when the dam is overtopped as a result of large waves generated from landslides into a reservoir or a sudden inflow of water from upstream dam failures. Dam failures typically occur with little warning and, depending on the size of the dam and the inundation area, the damage could be catastrophic. Almost all recorded floods on the South Platte River have been generated near the river’s headwaters on the slopes of Monument Divide. Past floods have resulted from snowmelt and intensive rainstorms over the mountain and eastern streams. Most flash flooding is caused by slow-moving thunderstorms in a local area or by heavy rains associated with hurricanes and tropical storms. Although flash flooding occurs most often along mountain streams, it is also common in urbanized areas where much of the ground is covered by impervious surfaces. Urbanization and lack of stormwater drainage often leads to flooding of roadways during storm events. Adams County currently monitors these areas and has noted that they are proactive in clearing the areas and closing the roads. Generally, floods are long-term events that may last for several days. The primary types of general flooding include riverine, coastal and urban flooding. Riverine flooding is a function of excessive precipitation levels and water runoff volumes within the watershed of a stream or river. Urban flooding occurs where man-made development has obstructed the natural flow of water and decreased the ability of natural groundcover to absorb and retain surface water runoff. Sudden melting of snowpack can result in significant flooding. Flash floodwaters move at very high speeds—“walls” of water can reach heights of 10 to 20 feet. Flash floodwaters and the accompanying debris can uproot trees, roll boulders, and damage or destroy buildings, bridges and roads. Flash floods provide residents with little warning for evacuation and, if severe, can be deadly. Before: What would you do if your property was flooded? Are you prepared? Determine how you and your family will receive information and warnings for flooding events. Preparedness starts with a mindset about staying aware. •Educate children about the dangers of playing in and near ditches and drainage ways. While little or no water may run through drainage ways on a regular basis, it only takes six inches of fast moving water to whisk a child down-stream. If you must prepare to evacuate, you should do the following:◦Secure your home. If you have time, bring in outdoor furniture. Move essential items to an upper floor. Turn off utilities at the main switches or valves if instructed to do so and if there is time. Disconnect electrical appliances. Do not touch electrical equipment if you are wet or standing in water. If you have to leave your home, remember these evacuation tips:◦Do not walk through moving water. Six inches of moving water can make you fall. If you have to walk in water, walk where the water is not moving. Use a stick to check the firmness of the ground in front of you. Return home only when authorities indicate it is safe. Have a qualified technician on scene to turn on power and gas. If you must walk or drive in areas that have been flooded, stay on firm ground. Moving water only 6 inches deep can sweep you off your feet. Standing water may be electrically charged from underground or downed power lines. Get a copy of the book Repairing Your Flooded Home (737KB PDF) which is available free from the American Red Cross or your state or local emergency manager. To see the full list of disaster preparedness tips for floods, please visit www.ready.gov/floods.